Time to ditch the bulky wallets you're carrying around and switch to the Silicone Phone Wallet! The 3M adhesive backing adheres securely to the back of your smart phone or smart phone case. The wallet is perfect for carrying your drivers license, ID card, hotel key, credit card or business cards. Perfect for direct mail, event merchandise, fetes, festivals, gift with purchase and product launches. The new trend is catching on quickly! 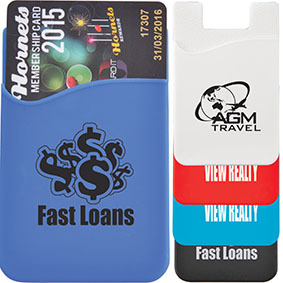 At a great price point, Silicone Phone Wallets are an amazing promotional item for your next marketing campaign. Branded with your logo, they will be constantly in the palm of everyone's hands!